I like to drink vodka from time to time, and when I drink, I drink a lot. 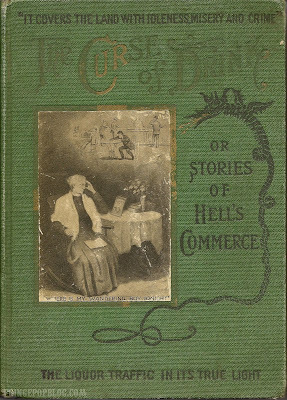 What I learned from "The Curse of the Drink: Or Stories of Hell's Commerce" is that I am one majorly messed up gal. Alcohol, if you didn't know, "covers the land with idleness, misery, and crime." So.... there could be a grain of truth in any crazy accusation. I'm sure alcohol is responsible for its fair share of idleness, misery, and crime. But, I'm cursed? C'mon. I swear these early 20th century fear-monger tracts would have gotten a lot farther if they weren't so gosh durn over-the-top. This particular tome is a thick one (over 500 pages) from 1909. I also love how every vice is characterized as a "traffic." Enjoy it in all its silly, fear-mongering glory.